LUX Photonics Consortium is proud to be a supporting organization of the Industrial Transformation Asia-Pacific (ITAP) 2018. The ITAP is a Hannover Messe Event focus on promoting Industrial 4.0 in the Asia Pacific. ITAP brings together the ecosystem of players and stakeholders across the value chain to learn, share, collaborate, network and do business with each other. In recent years, the optical industry has gradually transformed from a mass-manufactured, low-cost-oriented business model to innovative applications, such as automotive optics, artificial intelligence, the Internet of Things, and mobile devices. In response to the development trend of the optoelectronic industry, our annual optical event will share the latest solutions for the most popular lighting, imaging, nano optics, and mobile device optical designs, including ray tracing, color simulation, lamp design, AR/VR application, integrated optical path design, 3D sensing, LiDAR design, grating design, etc. Domain Experts invited from Synopsys Optical Solutions Group, Nanyang Technological University, and senior application engineers from CYBERNET SYSTEMS company will give you instant insight of the up-to-date optoelectronic technology. Please complete the registration form before 31-Aug-2018. *You may join the seminar online if you are outside of Singapore. Please check the “online seminar” option in the registration form and we will send you the link to join the seminar . LUX Photonics Consortium is leading a delegation of partners and member companies to Berlin, Germany to attend EPIC AGM and visiting EPIC member companies. LUX Photonics Consortium is exhibiting innovative technologies from faculty members of NTU, NUS and The Photonics Institute, as well as industry members ATRYZ and Pro-Health Water Technologies. Come visit us at booth Z7 to Z12. LUX Photonics Consortium is proud to be the Silver Sponsor for this event - 10th Lecture of the NUS Engineering Lecture Series by Prof Hong Minghui, a faculty member of LUX. LUX PHOTONICS CONSORTIUM will be participating and showcasing 8 TECH OFFERS from its members. Check out the details and come visit our booth! Singapore will play host to a Photonics Mega Conference, where three major photonics conferences will be co-located at Sands Expo and Convention Centre at Marina Bay Sands, Singapore. The Consortium had a fruitful and well-received networking and technology introduction event held on the 31st May at the Nanyang Polytechnic. At the event, Chairman Prof Tjin Swee Chuan introduced and welcomed 7 new industry members to the Consortium. 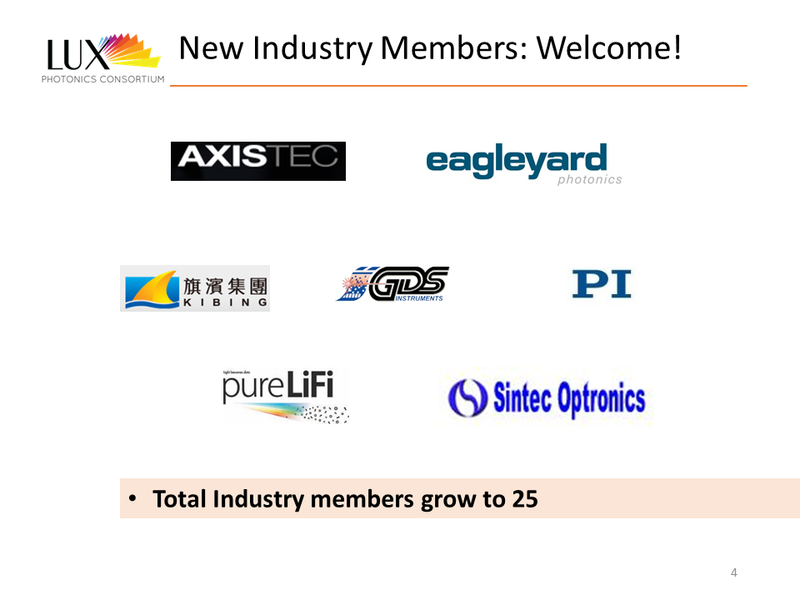 They are AXISTEC, EAGLEYARD, GDS INSTRUMENTS, KIBING, PI, PURELIFI and SINTEC OPTRONICS. Two new Faculty members also presented their technology offerings to the members. The event ended with a tour of facilities hosted by Nanyang Polytechnic. Consortium chairman Prof Tjin Swee Chuan giving welcome address and updates to members. Prof Lee Pooi See of NTU introducing her technology offerings. Assoc Prof Murukeshan of NTU sharing his research technologies. Consortium Chairman presentation slide can be downloaded here. For other presentation material, please contact us. LUX Photonics Consortium will be participating at the 21st edition of Manufacturing Technology Asia (MTA) 2017 and is a partner organization of the inaugural Optics and Photonics Innovation Hub. The event will be held on 4-7 April 2017 at the Singapore Expo. We are pleased to announce the following LUX members will be exhibiting with us at the Optics and Photonics Innovation Hub. LUX Photonics Consortium hosted a delegation of 15 members from the European Photonics Industry Consortium (EPIC) from 11th to 13th January 2017. The event was jointly organized by LUX Photonics Consortium and EPIC. EPIC members coming from Belgium, France, Germany, Netherlands, Spain, Sweden, USA, and New Zealand visited a few Singapore landmarks as well as LUX member companies GLOBALFOUNDRIES, DenseLight Semiconductor and Coherent Singapore; and had a glimpse of Singapore's photonics industry. This is part of the MoU signed between LUX Photonics Consortium and EPIC in April 2016 to form a partnership for bilateral business network expansion. Presentations made by both LUX and EPIC members can be downloaded here. See what Carlos Lee EPIC Director General has to say about the event here and how FibeReality's Mark Lutkowitz was impressed with the event in his Blog entry here.